Have you ever wondered what it is like walking through the rainforest canopy? The famous Canopy Tours can help you achieve your dream Costa Rica vacation. Costa Rica is a small country but the activities are endless. Starting with Canopy Tours and hiking in the rainforest and ending with one of the many water activities like surfing and sportfishing. 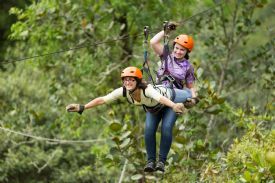 Canopy Tours is becoming one of the most popular activities in Costa Rica. On the tour, you are hoisted up to a platform in a tree about 50 feet up, securely tied to a zip line and then sent flying to another platform in a tree via a zip line. The small Quaker community of Monteverde is where the first Canopy Tours began, and have since spread out all over the country. This is truly an adrenalin filled experience that should not be missed. There of course are more traditionally popular activities like surfing and white water rafting. Surfing is good throughout the year with the months of June and July being the best for southern spots like Pavones and Matapalo. The central pacific coast as well as the North Pacific coast is good all year. Some more popular breaks are in Playa Grande, Playa Negra and Playa Hermosa just to mention a few. White Water Rafting is also world class with the best time to navigate the rivers being during the rainy season when the rivers are flowing, from May to December. Sportfishing is another popular activity in Costa Rica. Depending on the time of year you go will greatly depend on what you will catch. There are many types of fish catch ranging from Dorado, Wahoo, Roosterfish and Tarpon. Of course for all of the large game fish there is a strict catch and release policy. Costa Rica is known for its active volcanoes. Arenal Volcano is the most spectacular of the many volcanoes in Costa Rica. Here you can see Arenal volcano erupt on a daily basis. There also are beautiful hot springs nearby where you can spoil yourself in one of the many full service spas. If you want a day trip from San Jose, the capital, you can go to Volano Poas. Poas Volcano has a huge crater over one mile in diameter and it also has one of the largest geysers. Volcan Irazú is also a day trip from San Jose. Irazu Volcano is a bit less spectacular than Arenal or Poas but still worth the while. 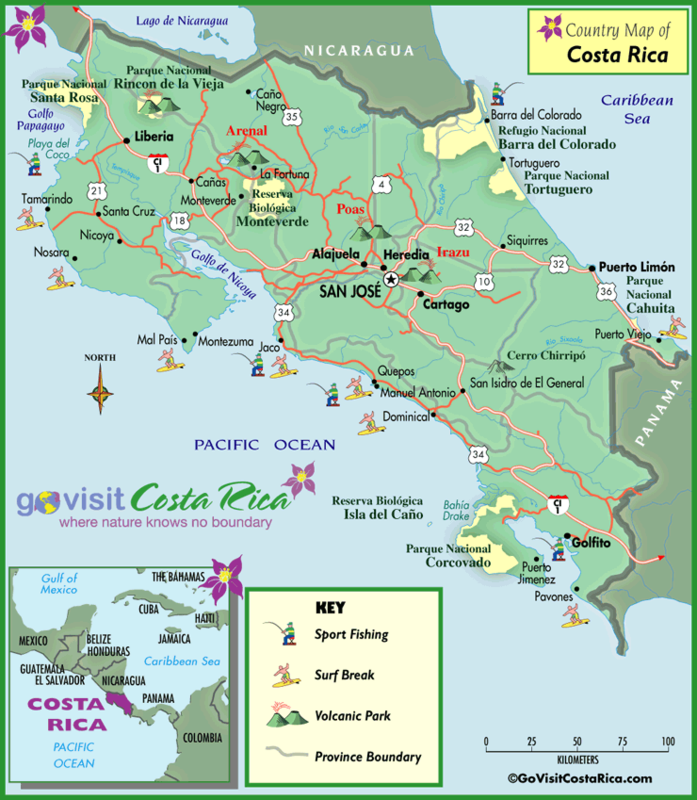 Click on the map to select a region of Costa Rica. A vacation to Costa Rica is not complete until you visit one of its many tropical forests. Monteverde Cloud Forest is one of the most popular Reserves in the country. However by the laid back feel to the neighboring town of Santa Elena you would not expect that it is one of the most visited destinations in Costa Rica. The unspoiled cloud forest of Monteverde is very popular with birdwatchers. The Quetzal is of particular importance where you can see the rare and exclusive bird. Corcovado National Park, although much harder to get to, is one of the most beautiful rain forests in the world. Costa Rica is a country rich with nature and where there is nature there is adventure. Adventure Travel activities in and around Costa Rica are so plentiful you are sure not to run out of things to do. Looking for outdoor activities, dinning or entertainment, or do you want to learn Spanish? Spas, Weddings, Casinos, Bars, Restaurantes...Dine, drink and be merry. Costa Rica offers varied and welcoming entertainment.